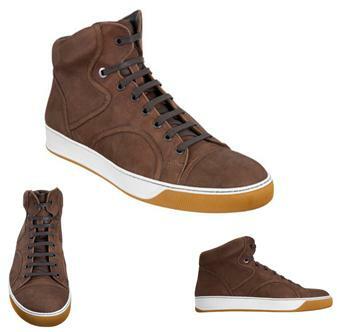 Fellas, let me introduce you to an edgy and rugged sneaker that is right on time for Fall…. The new Lanvin Mid-Top Sneaker! These sneaks are made in Italy out of soft camel color nubuck material, strong dark brown laces and a rubber sole for added comfort. Paired with Lanvin baggy jeans, a crispy long-sleeved Polo, Lanvin accent scarf and brown aviator shades and your Fall outfit is complete! The Lanvin Mid Top Sneakers retail for $795 and can be purchased at Barney’s New York!